Oh, I don’t use paper maps anymore. – Coworker. One of the advantages of flying the USA I guess! A co-worker recommended that I fly out of San Carlos airport (KSQL), so I decided to take a look at the surrounding airspace to get familiar with flying in San Francisco. It’s pretty complicated. 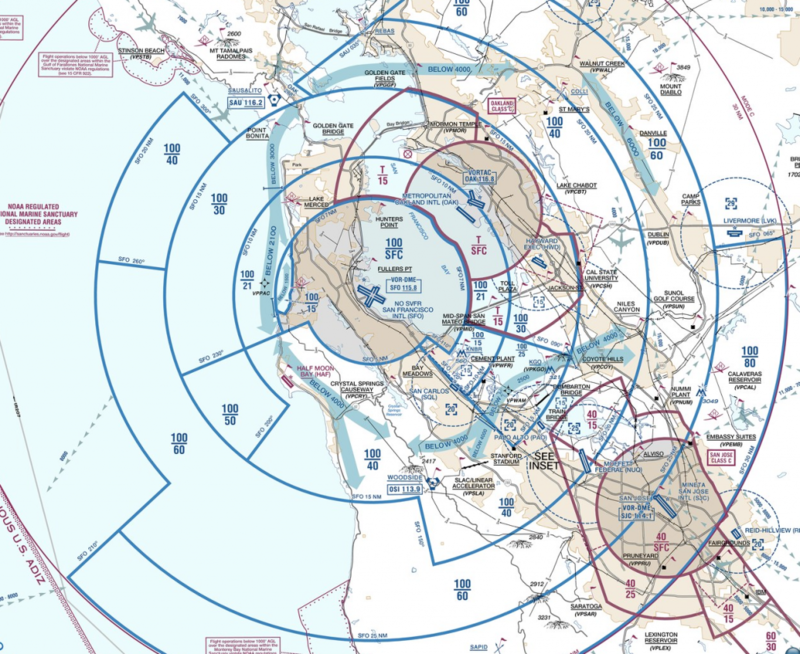 So much so, that the FAA produces a special “Charted VFR Flyway Planning Chart”. It’s actually really handy over the standard VTA (oops! Sorry, they call them TACs here) style chart. Class B airspace (below 12,500′)! Way more airports, not just two like YTZ and YKZ. Looking forward to being able to fly again though! My studying is going well, about 50% done. I’m hoping to write the exam in two weeks time, to avoid any possible hassles with my Aviation Document Booklet expiring in September. Next story Laser Pointers are Dangerous!